Standouts Jay Butterfield and Sione Vaki continued to make plays for No. 14 Liberty in its win Friday at Santa Rosa Cardinal Newman. Photo: Daniel Poulter. No. 3 De La Salle avenges big loss from last season to Bishop Gorman of Las Vegas with a 27-21 win that got very scary in the final minutes. The biggest upset of the night was in Orange County where unranked Villa Park (won’t be unranked next week) knocked off No. 13 Servite of Anaheim. Narbonne and Gardena Serra, meanwhile, need two overtimes to settle another great clash between those two talent-laden squads. Note: Look for a brand new State Top 50 set of football rankings that won’t simply be a list on Monday. We’ll have insights and breakdowns based on more than 40 years of going to Friday night games with an overview of the state’s top teams and what’s coming up that just can’t be matched. It’s more than 8,000 words of jam-packed info. Each new set of rankings will be for Gold Club members only. The late Friday/Weekend Scoreboards will be free posts and will provide snippets of info, comments and more. Did not play. The Monarchs have a bye this week and will take a streak of three straight shutouts into their showdown next Friday at home vs. nationally ranked IMG Academy of Florida. Their recent shutout streak includes one of 42-0 vs. Bishop Gorman of Las Vegas. Defeated No. 41 Chaminade (West Hills) 56-20. This is the same team that lost to No. 6 Folsom 70-34 in its previous game. That one also was 35-0 in the second quarter. The Braves were ahead 42-6 in the first half. As they say, a rout is a rout. It looks like a sea of humanity as St. John Bosco players line up to shake hands with players from Chaminade after 56-20 win on Friday in West Hills. Photo: @BoscoFootball / Twitter.com. Defeated Bishop Gorman (Las Vegas) 27-21. The Spartans broke a 14-14 tie in the second half on a 53-yard run by Henry To’oto’o and a scoring pass from Dorian Hale to Richard Fahiua. They couldn’t quite put away the Gaels, though, who lost 42-0 to No. 1 Mater Dei a few weeks ago. They got a key fourth down stop, scored with less than three minutes left and got the ball back with a chance to steal it at the end. The clock ran out as Gorman players were frantically trying to get one last possible game-winning play. Defeated Valley View (Moreno Valley) 77-7. It will be a shock if the Huskies are not 10-0 heading into the CIFSS D1 playoffs. They are off next week, then open league play vs. Corona Santiago. Defeated Murrieta Valley (Murrieta) 49-14. Another impressive outing for the Lions who rolled over team that had beaten San Clemente in its previous outing. Defeated No. 30 Oak Ridge (El Dorado Hills) 62-6. Although both Oak Ridge and No. 29 Del Oro (Loomis) have been impressive this season, the Bulldogs are just playing at a different level than any other team in the CIF Sac-Joaquin Section. Folsom led 55-6 at halftime behind QB Kaiden Bennett, who accounted for six TDs. Defeated Heritage (Menifee) 35-16. Ryan Hilinski led the Lancers with five TD passes. Their only loss is to No. 4 Corona Centennial. Defeated No. 11 Upland 41-8. Akili Arnold raced for a 49-yard punt return TD and Joey Yellen passed for 238 yards as the Diablos rolled over a team many thought would get much closer. Defeated Faith Lutheran (Las Vegas, Nev.) 50-10. Caden Bell tossed four TD passes for the Lions. They also displayed great special teams play that helped set up some of the scores. Defeated Oak Hills (Hesperia) 42-22. First game win over Helix also is looking better and the debate between the Cowboys and Upland about which should be No. 2 in the IE behind Centennial will likely subside since Upland lost to Mission Viejo. LOST to No. 8 Mission Viejo 41-8. The Highlanders can still look at themselves as a favorite in the CIFSS D2 playoffs because the difference between the top teams in CIFSS D1 and D2 is rather large. Defeated Turlock 54-14. That makes it three CIF Sac-Joaquin Section teams that the Grizzlies have routed. The easy games will finally end in two weeks when state-ranked Buchanan of Clovis visits Koligian Stadium. 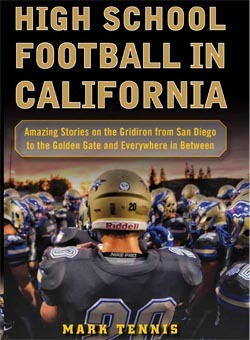 We will be there and will do a book signing the next day in Fresno. LOST to Villa Park 28-14. This was the upset of the night. Villa Park, though, actually played Mission Viejo a lot closer than Upland so maybe it’s not that shocking if you look at it that way. Still, for a Trinity League team to lose to Villa Park means an 0-5 Trinity League record may be hard to avoid. WR Jason Heller was the center of attention for his play-making skills during No. 22 Westlake’s strong outing against Moorpark. Photo: @FootballRecruit / Twitter.com. Defeated No. 49 Cardinal Newman (Santa Rosa) 31-14. A 79-yard fumble return TD and a 54-yard TD pass by Jay Butterfield helped the Lions get out to a 24-14 halftime lead. The defense took it from the there. Defeated El Camino of Oceanside 36-14. The votes will probably stay close between the Falcons and La Costa Canyon for No. 1 in San Diego, but it doesn’t matter since the two will end the regular season going aganst each other. Defeated Oceanside 31-20. The real debate in San Diego may not be at No. 1 and No. 2 but between No. 4 and No. 5 since the section is going to only four teams in its Open Division this season. Did not play. The Lancers, like the rest of the teams in the West Catholic Athletic League, took a bye week before the start of league games. They play next on Sept. 21 at home vs. St. Ignatius of San Francisco. LOST on Saturday night to Orem of Utah 51-46. It was a back-and-forth matchup all evening, including 35-35 tie in third quarter. Orem lost in its previous game 31-21 to Bishop Gorman of Utah, which just lost to De La Salle 27-21. Not that bad of a loss. Did not play. The Dons do have a bye this week. They’ll be back next Friday and shouldn’t have much trouble with Olympian of Chula Vista. Their only loss is to No. 16 La Costa Canyon and they have a win over No. 24 Serra of Gardena. Defeated No. 50 Cathedral (Los Angeles) 42-21. The Lancers, who have a one-point loss to No. 9 JSerra, should move up after this week. A pick six by Deven Jarvis and a 52-yard punt return TD by Jaden Allen sparked the win. Did not play. We don’t know if any of the Bear coaches or players made the trek to see No. 3 De La Salle in person on Friday, but they were on a bye and the Spartans were playing at home against Bishop Gorman. Defeated No. 47 Moorpark 34-0. Many of the Warriors’ earlier wins over quality opponents were much closer. This one wasn’t and the Musketeers were unbeaten. Defeated Redlands East Valley (Redlands) 52-37. Although Servite losing doesn’t help with their ranking, the Cougars showed explosiveness in another win. LOST to No. 39 Narbonne (Harbor City) 27-26 (20Ts). Doug Brumfield passed for 373 yards and three TDs, but also had a pair of interceptions. Serra just had a win over Long Beach Poly while Poly had a win over Narbonne so naturally Narbonne got this win. Defeated Vacaville 40-7. The Pirates only had to travel to Solano County for this game and not Riverside County (like the previous week at Corona centennial). A solid bounce-back win. Defeated Marin Catholic (Kentfield) 47-28 Saturday. Defeated Monte Vista (Danville) 17-16. Defeated Trabuco Hills (Mission Viejo) 55-7. LOST to No. 14 Liberty (Brentwood) 31-14. Defeated Valhalla (El Cajon) 52-0. Defeated Millikan (Long Beach) 46-15. LOST to Vista Murrieta (Murrieta) 34-6. LOST to No. 22 Westlake (Westlake Village) 34-0. Defeated No. 24 Serra (Gardena) 27-26 (2 OTs). LOST to No. 6 Folsom 62-6. LOST to San Juan Hills (SJ Capistrano) 7-6. Defeated No. 13 Servite (Anaheim) 28-14. Defeated Madison (San Diego) 34-6. Folsom should have beaten De La Salle? So did they choke? In the end, wiping out Chaminade isn’t going to mean much. That team was better last year, won the league and then lost to a team that was 0-5 in the Trinity League. Should have wouldn’t be accurate. Could have is fair. Did Folsom choke? No. Henry To’oto’o was on Kaiden Bennett literally every play, spying him and sometimes blitzing. Do believe DLS worked all summer on that offense, knowing that to even have a shot at CIF Open Division required winning that game. Mark is spot on, like usual. Folsom definitely had their chances and definitely could have won. The turnovers really hurt, but credit has to go to the DLS defense. They did their homework and were able to stop Folsom when needed. Do I think DLS is better than Folsom? No, but they were better this night and Folsom has proven they are one of the top 5 in the state. Centennial’s win over Chandler, Ariz. requires it to be higher than Folsom. Some national rankings have Centennial in top 10 and ahead of DLS. Oaks Christian win vs Chaminade not quite as easy as Folsom’s of course but that team also still has Calabasas and Westlake coming up and I think both of those teams are better than Del Oro, Oak Ridge, etc. Folsom probably will eventually get up to fourth depending on how close Centennial is to Bosco/MD or how close Oaks is to those two. Based on last two years, having the projected CIFSS D1 top four seeds in the top five of the state with DLS in the middle of them just makes the most sense. Now folsom does play dls next year in folsom…folsom will have badger, daniyel ngata, a supposed qb that is supposed to be incredible, a great jv team..but what about the rest of the team..should we expect to see mostly same team save jo ngata and kaiden bannet? What about dls next year?